Every spring I like to look at the little chickadees that fly around my home. Chickadees are very fond of bird baths and wil splash about in the water, jump on the near branches and have a beautiful song. The cute shape and distinctive sound of these birds make them universally liked. Chickadees are great for your garden and will eat pests like caterpillars, bugs, spiders and beetles. The Black-Caped Chickadee is a common bird in backyards and is early spotted by its distinctive markings. It has white cheeks and i dark black cap on the head. They are highly sociable birds and can be seen in flocks. If you install a bird house in your backyard chickadees are very quick to use it. These birds are accustomed to humans and will not be afraid of them. If you want to attract birds Chickadees are one of the easiest birds to come to your feeder. Bird houses designed for small song birds will invite them, as well as bird baths with fresh waters. If you plant shrubs and small trees around your home it will offer them the cover and a place to hangout. What Do Chickadees Eat & Food? They love to eat Sunflower Seed, crushed peanuts, wild berries, Suet Nuts & Berry Blend provided in bird feeders and hunt for insects around your garden. In winter chickadees will switch to more plant diet like berries, seed and other things they find. They will eat suet and peanuts butter, it is a valuable food for them that provides good energy in cold weather. In spring and summer chickadees will go back to 80% insect diet and will hunt for spiders, grasshoppers and other insects that are available. If you provide mealworms in summer they will take some to feed their young. If you have a garden chickadees will serve as great pest control eating all the bugs that you don’t want on your plants. All song birds are great to have in your backyard if you are planting vegetables or fruit. They are the best natural pest control and you don’t have to use harmful chemicals on your plants. Hanging a small bird feeder will attract them to your yard and all parties will have benefits from this relationship. Bird feeders: Tube feeders are the best choice to attract small song birds. Chickadees will love to cling to the sides of the feeder and peck on the food. Sock feeders are one more option that you can try, suet and peanuts can be great in winter. Winter birds need oil found in peanuts and sunflower seed to keep them warm and provide energy for the cold nights. If you plan to install more than one bird feeder, hang them with some space from each other so birds don’t have to fight for the feeding spot. I recommend that if you have multiple feeders to offer different seed on each feeder to attract different bird species. This way you will enjoy lots of varieties in your backyard. 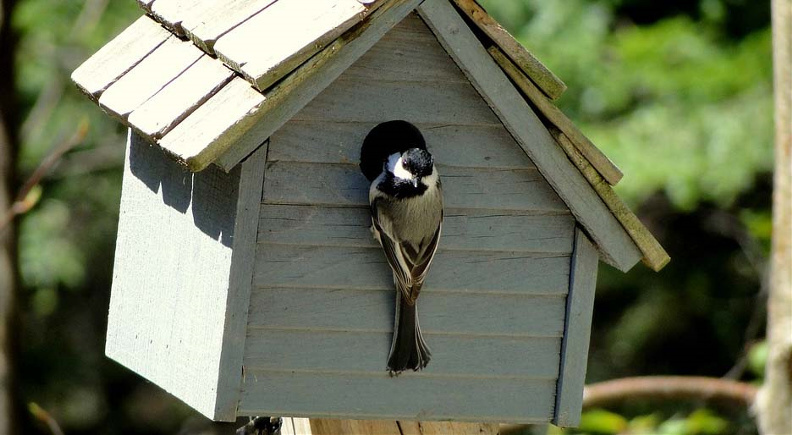 Nesting Box: Chickadees are cavity nesters and will inhabit human made chickadee birdhouses specified for them. chickadees are not to picky when looking for homes, but make sure to provide 1 1/8 inches entrance hole. Look for the place away from direct sunlight and strong wind to mount the bird house. A Tree, pole or a house wall can be used to place the nesting box at about 4-13 feet above the ground. If you place some straw or sawdust inside you will encourage them to nest and lay eggs. - Provide landing areas next to bird feeders where birds can rest and scout the surroundings. - Place your bird feeder in a place where birds can see cats coming, this will save some lives, cats love to hunt for birds. Attracting chickadees is easy, these acrobatic birds are not demanding, and since they are not shy around humans chances are you will see one today if you have a bird bath or a feeder. During winter time, Black colour-capped Chickadees have a tendency to flock collectively, and when spring season comes, they will start choosing buddies. Nesting season endures from May thru June. The birds often establish number of nests prior to selecting the nest to use, which can be typically within a partially rotted trees trunk area or an older woodpecker home. Throughout nesting, they really do not prefer getting disrupted and can transfer nests if potential predators can be found. When the home is picked, the female will lay several or up to six eggs and can incubate them for approximately twelve days, while the male one feeds her. Young Black colour-capped chickadees usually vacate home after sixteen days. The mating routines of such birds are minimal. Whilst the males will chase other male off their territory, you can notice some partner feeding, there is no actual major Chickadee courtship display. Couples typically break the smaller winter month flocks, in which have been feeding jointly during wither and start selecting mates. These types of birds are actually cavity nesters and their home within wild area is likely to be seen in wooded places. The female will create the nest utilizing moss and smooth components, needing about four-five days to accomplish. She will lay somewhere around six eggs that are white-colored with speckles and she herself will incubate them for approximately twelve days. Throughout the incubation period the male will take the responsibility to provide for her. Male is waiting near the home and when she starts to lay eggs he starts feeding her. Occasionally female departs the nest and notifies the male, and then he brings food for her. She will feed on her own occasionally. Right after young hatch, the female will feed the chicks for the first time. During this time period the other partner chickadee consistently brings meals. Following the hatching, both female and male take equal responsibility for feeding younger birds. These young ones will leave the nest in approximately sixteen days. Ten days after fledging, the mother or father bird will no longer nourish their offspring. 1 - 2 broods are elevated every year. Following the nesting period when the chicks have left the home, you can observe these birds to form small flocks having dozen or even less individuals, they tend to stay close to their birth area throughout the entire winter season. Every flock includes some of the juveniles, some adult pairs, plus some individual grownups. The flocks create a dominating couple creating feeding territory that protects it from other flocks. Since these birds are non-migratory you will see them al year-round. Make sure in winter you provide more oily seed and suet to help them stay warm and get energy. I hope you liked this how to attract Chickadees in your backyard article and keep birding.